Health Sciences Libraries – Part of Interprofessional Education Too! The Library Genie Strikes Again! As UMB’s IPE Day 2017 (April 5) fast approaches, there is some exciting news from the Interprofessional Education Collaborative (IPEC). A January 2017 press release announced the inclusion of the Association of Academic Health Sciences Libraries (AAHSL) as an institutional member. This announcement acknowledges the potential contributions of librarians and their expertise to IPE teams. Since the arrival of Dr. Jay Perman, with his passion for, and interest in, interprofessionalism, HS/HSL faculty librarians have become critical members of the IPE strategic planning initiative and, from the very start, members of the IPE Day and IPE Faculty Development planning committees. The only place we haven’t served is on an actual IPE team. As knowledge experts, what can librarians contribute? While each of the health professions brings their own expertise, not everyone can know everything; librarians bring the evidence to support enhanced clinical decision-making. We are also extremely knowledgeable about credible consumer health information that, when clearly and simply written, can support patients after they leave the healthcare setting. And we assist student learners to search the literature efficiently and effectively. If you are still a little skeptical about including a library faculty member on an IPE team, consider applying for an award or seed grant from UMB’s Center for Interprofessional Education and including a library faculty member as a member of the IPE team. It’s a great way to try an experiment and get some money to do it! Contact me if you are interested, and I will put you in touch with the right people at the HS/HSL. Make use of our Innovation Space with staff expertise on-demand during walk-in hours: Monday through Friday, 2:00 p.m. to 4:30 p.m. With no reservation required, Innovation Space staff will be on hand to answer your questions and show you how to use a variety of innovative tools, including our 3D printers, 3D scanners, button maker, and Google Cardboard viewers. Have a project that requires graphic design software, video and audio editing, 3D modeling, or photography? We’ve got you covered! The Innovation Space just launched a Multimedia Mac Pro, equipped with a full Adobe Creative Cloud subscription, and much more. Some experience with the software is highly recommended, though we do provide a guide for support and have staff members that can answer questions. The multimedia Mac Pro is available on a first-come-first-served basis – no reservation required. 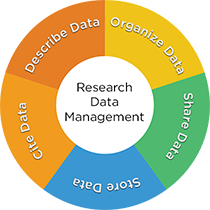 The HS/HSL is debuting new services in research data management. Many funding agencies are requiring that data management plans be submitted with grant applications. An effective plan to collect, share, reproduce, and preserve data may increase the impact of your research. The HS/HSL also offers workshops in data management including Data Management, 101 and Creating a Data Management Plan with the DMP Tool. At the start of each spring term, the HS/HSL staff take the opportunity to look through UMB’s ‘fresh eyes’ to see how well the Library is meeting users’ needs. 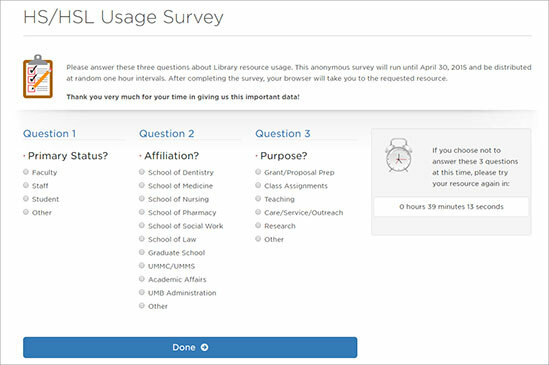 During the month of February, the HS/HSL emailed a brief survey to the new students in each school, soliciting opinions on such topics as the features they liked most and least in their previous academic libraries, what services and resources they have used so far at HS/HSL, how they would rate staff support and building facilities in the Library, and what communication methods they prefer to stay informed about Library programs, resources, and services. This year, as last, almost 100 students offered feedback on their experience and observations during their first term. We appreciate that, despite the many demands competing for their attention, students took the time to respond so thoughtfully. The students’ opinions and suggestions will be valuable to us as we strive to continue providing a comfortable and safe study environment, along with the expertise and resources to support learning and research. After a careful analysis and review of the qualitative data from this year’s New Student Survey, Library leaders will use this data, along with data from other user feedback tools, to measure HS/HSL’s success and identify areas for new services and improvement. School of Dentistry graduate student tests the new fountains. One consistent request the Library Genie received was for updated water fountains in the HS/HSL. Six new water bottle filling stations have been added, one on each floor, to replace the outdated models. 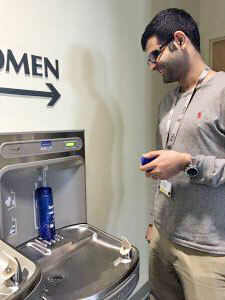 The new water bottle filling fountains are fast and curtail waste by reducing the number of plastic water bottles we use. There is even a nifty counter on each fountain to calculate how many plastic bottles we’ve saved so far. Since the fountains were installed and as of March 22, 6,268 bottles have been saved. We hope you enjoy these new fountains as much as we enjoyed acquiring them for you, making the HS/HSL a more pleasant and convenient place for all. From DNA to BEER, Harnessing Nature in Medicine & Industry exhibition is on display in the HS/HSL Weise Gallery through April 22, 2017. Life forms such as bacteria, yeasts, and molds can cause sickness or restore health, and help produce foods and beverages for our consumption. From DNA to Beer: Harnessing Nature in Medicine & Industry explores some of the processes, problems, and potentials inherent in technologies that use life. This traveling exhibition was developed and produced by the National Library of Medicine and the Smithsonian’s National Museum of American History. 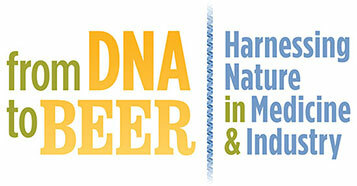 Please join us on April 12 for a special event to accompany our latest gallery exhibit, From DNA to Beer: Harnessing Nature in Medicine & Industry. The event will begin at 4:00 p.m. in the Library’s fifth floor Gladhill Board Room with a talk featuring enthusiastic homebrewer Drew Morgan. Drew will share stories and insights about his brewing hobby and discuss some of the science behind making beer. Following the talk, there will be a reception in the Gladhill Hallway. Although the event is free, seating is limited, and you must have a printed confirmation/ticket to attend. Attendees must be 21 and IDs will be checked the day of the event. For additional information, contact Library Administration at 410-706-7545. Between 1990 and 2013, the U.S. population identified as having limited English proficiency grew 80 percent, from nearly 14 million to 25.1 million. 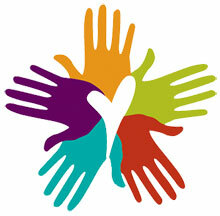 Cultural diversity within the U.S. continues to increase. If you provide care for patients or clients with limited English proficiency, did you know the Library provides access to a range of quality multilingual, multicultural health information resources? If you’d like to know more about these resources, come to our Health Information Resources for Culturally Diverse Patients workshop on Tuesday, April 25th from 12:15 p.m. to 12:45 p.m. Learn where to locate patient education resources, including medication information, available in other languages as well as those written in easy-to-read English. Discussion will include the potential impact utilizing health literacy resources can have on patient adherence, safety, and satisfaction. Visit the Library’s Spring 2017 Workshop Schedule to register. What is the user’s status: faculty, staff, or student? With what school or unit the user is affiliated? What is purpose for the use (research, assignments)? 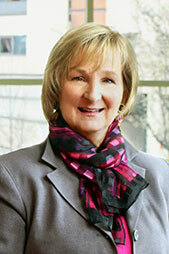 Katherine Downton, MSLIS, was promoted in January to head of Research, Education & Outreach Services. She will supervise six faculty librarians who collaborate with and support the Schools of Medicine, Nursing, Dentistry, Pharmacy, and Social Work. The Research, Education and Outreach (REO) department develops classes and web-based tutorials for students, faculty and, staff; provides expert searching for systematic reviews and other research; analyzes impact of research, provides consultations for students and researchers; and more. Katherine served seven years as a REO librarian to the School of Nursing before accepting her new position. Please contact her to learn more about REO services or discuss ideas for new services and collaboration. Erin Latta recently became the NNLM DOCLINE coordinator for the United States and Canada. Erin previously served for 8 years as an electronic resources specialist in the HS/HSL’s Resources Division, where she managed and maintained electronic resources. Bohyun Kim, MA, MSLIS, published "Academic Libraries and the 2017 Top Ten IT Issues in Higher Education," in EDUCAUSE Review 52(1), 2017. She also served as an invited panelist on the American Libraries Live episode "Makerspaces" on February 16, 2017. M.J. Tooey’s 2016 Medical Library Association’s Janet Doe Lecture was published in the January edition of Journal of the Medical Library Association.